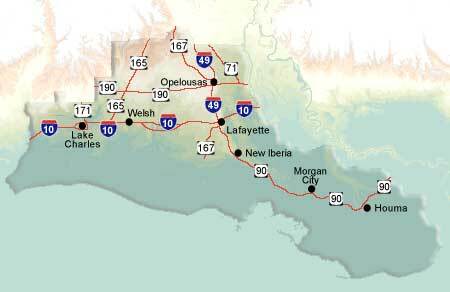 The Southwestern Region of Louisiana is known by some as "Cajun Country". It boasts both bayous and big cities. In Lake Charles the architecture reflects the individual styles of the carpenters who came here in the 1880s. The town of Lafayette offers two fascinating living history museums, Acadian Village and Vermilionville, as well as great seafood and Cajun dishes. Opportunities for outdoor activities abound at such places as Louisiana's only National Scenic Byway, the 180-mile Creole Nature Trail; Sam Houston Jones State Park, and Grand Isle State Park. Fishing charters in this part of the state leave from Grand Isle, Cocodrie, Golden Meadow, Port Fourchon, Dulac and Leeville.